Canon has confirmed that a professionally oriented mirrorless camera is currently being developed. In an interview with DPReview, the company stated that "the pro-level camera that you're expecting is on the way". Canon launched the EOS R series last year with the EOS R camera, together with four lenses that include the RF 35mm f/1.8 IS STM. It broadened the range earlier this year with the EOS RP, and also announced that it would shortly have six further lenses available for the system, all but one being professional-grade L-series lenses. In the interview Canon also revealed that one of the advantages of the faster communication allowed by the body and the new RF mount is that it has allowed Canon to work on a combination of optical (i.e., lens-based) and in-body stabilization. Canon currently only offers image stabilization in its lenses rather than at the sensor level, although it also provides a digital stabilization option for video that works in partnership with the optical technology. Body-based stabilization would provide users with stabilization for lenses that lack an equivalent system, such as the many EF lenses that can be mounted on the EOS R and EOS RP bodies via one of Canon's adapters. 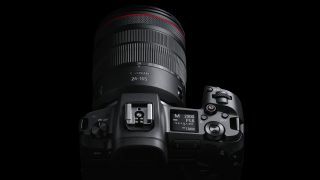 As Canon points out in the interview, a further advantage is that it would allow body-based and lens-based systems to work together, a principle that's already used by the likes of Panasonic and Olympus. Canon also took the opportunity to reaffirm its commitment to both its EOS DSLR line and its EOS M series of APS-C-based mirrorless cameras. The company's most recent DSLRs were the Canon EOS Rebel T100 / EOS 4000D and EOS Rebel T7 / EOS 2000D, which were jointly announced a year ago. The company hasn't added any further cameras to its EOS M system since the EOS M50, although it did introduce the EF-M 32mm f/1.4 STM lens towards the end of last year, and rumors of a replacement for the aging EOS M5 and M6 models persist.